“We’re over-policed and over-polluted,” he said later. The conference took place the first weekend in March. More than a hundred young people attended, most from the New York region, but several had traveled from the South and Midwest. They had come to learn, among other things, how to write grants and how to engage people to their causes through social media. In one room, students discussed petitions, protests, demonstrations, lobbying, and boycotts. “Elected officials may say things to you that sound good to the ear, but you’ll need to follow up to make sure they go through with what they say they’re going to do,” one participant said. Sharon Jaye, the director of sustainability of the Division of School Facilities at the New York City Department of Education, took in the scene amid blaring music between sessions and explained how her office, one of the event’s sponsors, is always trying to recruit students into leadership roles. But, she said, sometimes even after young people become involved, they find that adults ignore their efforts. That’s why they need to be trained in the political process, or “how to use that voice,” she said. 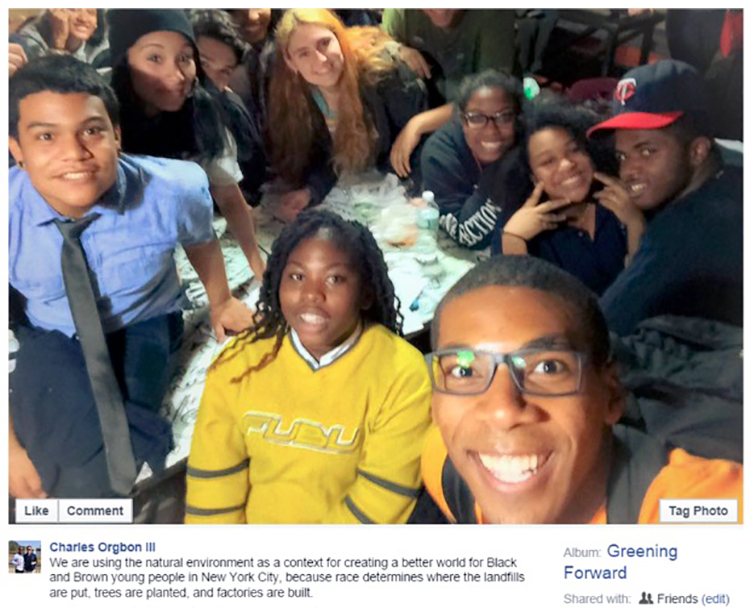 One of the groups at the conference, Global Kids, has been using its voice at city hall in a quest to make climate education a required part of the New York City curriculum. A draft resolution to that end has been created, and it has the support of Costa Constantinides, who represents the Astoria section of Queens on the New York City Council and will sponsor the resolution. The group can only recommend that the New York City Schools chancellor, Carmen Farina, adopt the curriculum, though it is lobbying in Albany as a backup effort. 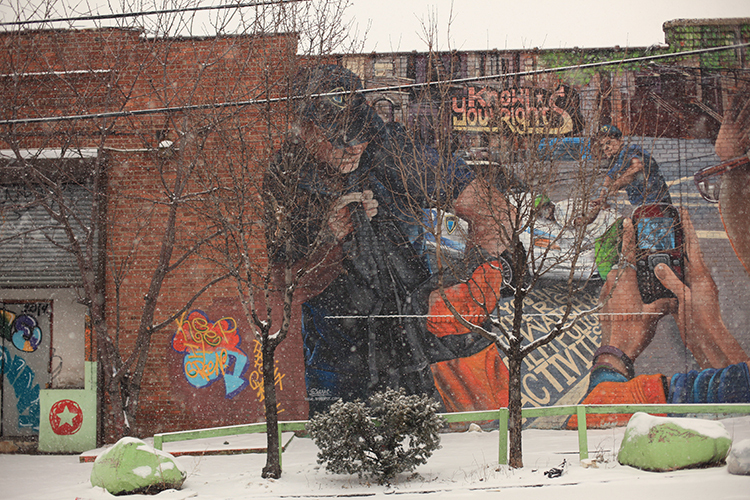 A mural in Hunts Point protests the “over-policing” in the area. 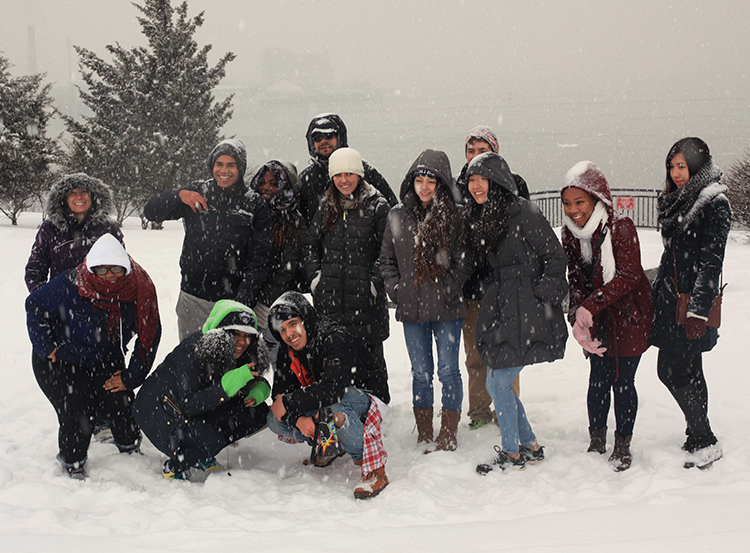 Outside, snow fell heavily as leaders from ACTION began their environmental justice tour of the neighborhood. The first stop was a mural painted on the side of the Point’s building that read “Know Your Rights.” An image of police performing a “stop-and-frisk” procedure includes a man holding a cell phone to record the scene. The local kids explained to their out-of-town guests that this was a normal occurrence in their neighborhood. The mural served as an illustration of “overpoliced” before the students began the “overpolluted” segment of the tour. They departed the residential area, which quickly gave way to warehouse after warehouse. Factories, recycling plants, and food distribution centers, not to mention their accompanying delivery trucks, make up much of Hunts Point. The group was headed to Barretto Point Park, a 30-minute walk from the residential area. The kids told visitors that the walk would be easier on Sunday because they wouldn’t have to dodge the hundreds of trucks that normally rumble through on weekdays. Danny Peralta, the Point’s director of arts and education, explained that Barretto Park once sat beside a fertilizer plant. The plant cooked human waste, releasing gases into the park and the nearby residential area that made an already high asthma rate all the worse. Residents sued. The plant closed. The park was renovated as part of a settlement. In the summertime, a pool floating on a barge is brought in and placed off a pier where the Long Island Sound meets the East River. J. P. Vinals, an 18-year-old ACTION volunteer, said that he would’ve never known about the park if he hadn’t joined the group—and he lives up the street. “They need to make it easier to be found, maybe put up signs around, and make it easier to get here, because there’s so many trucks,” he said. “There needs to be a pathway.” Vinals said that once he and his friends knew about the park, they skateboarded or biked down. But he added that if his mom wanted to come with him and his younger brother, the round trip by bus would cost the family $15. Tom Stoelker is a contributor to the Philadelphia Inquirer, the Wall Street Journal, and the Architect’s Newspaper.